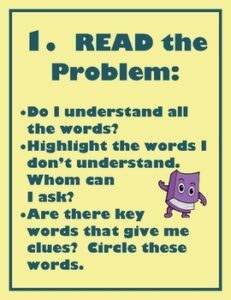 A set of 7 math posters for your classroom that show students step-by-step how to decode and solve word problems. The problem-solving graphic organizer that correlates with these posters is also included. Use these posters and examples of student solutions using the graphic organizer to create a problem-solving bulletin board in your classroom.